The history of the railroad in Indiana began in earnest in 1838, when the first steam train traveled from North Madison to Graham's Ford, carrying Governor James Wallace, legislators, and other dignitaries on an 8 mph, 15-mile inspection trip. In 1832 the Indiana legislature had chartered eight possible railroad lines. None of these charters were realized as, due to the recommendations of the Committee on Canals and Internal Improvements, state funds were committed mostly to the building of canals. By 1848 approximately 1,015 miles of canals linked Indiana to the eastern seaboard. However, in 1836 Governor Noah Noble signed into effect "An Act to Provide for a General System of Internal Improvements," which authorized borrowing up to the amount of $10,500,000 for projects which would include extending and completing the Wabash & Erie and a new railroad line from Madison on the Ohio to Lafayette on the Wabash via Indianapolis. The completed Madison line provided an important lessons to inexperienced American railroad builders: the grades were too steep for standard locomotives, necessitating the use of 8-horse hitches to haul cars up the grade. Down-grade trips were even more problematic, the grade allowing a dangerous build up of speed which often resulted in derailment, injury and death. Early locomotives averaged 15 mph for express and 10 mph for freight. Trips across the state could run between sixteen and 35 hours, not high speed by today's standards, but easily beating wagons and canal boats. The first locomotive to run in Indiana was the four-wheeled Elkhorn, a British manufactured engine. It was not suited to the demands of the American landscape and was quickly replaced with the 4-2-0 locomotive design by the Baldwin Locomotive Company. Indiana's second and third locomotives, the Madison and the Indianapolis, were of this manufacture. Growth of the railroads was slow during the 1840's. Railroads were originally backed by State Initiative as a way to link waterways and transportation for crops to eastern markets, making Indiana's interior farmland more useful. Crops could be shipped via the Ohio and Wabash Rivers to Lake Erie and the Erie canal, cutting down the cost of shipping. 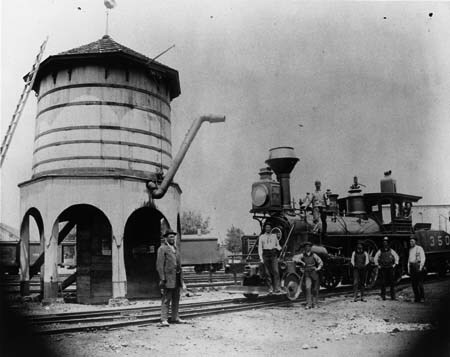 In the 1850's the railroad became the central impetus of Indiana's development. The bulk of new construction during that decade was in east-west orientation, providing connections for western travel. In 1856 Indianapolis was connected with St. Louis. In June of the next year a grand excursion from Baltimore to St. Louis celebrated the linking of the two cities via the "American Central Route." 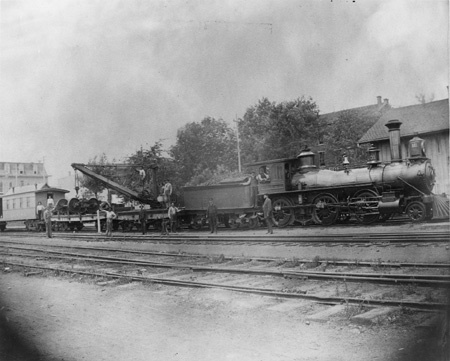 The years following the Civil War saw Indiana's railroads providing increased service for passenger transportation, plus delivery of fuel and raw materials to support Indiana's growing manufacturing businesses. Improvements during this period included standardization of track and compatible wheels, couplers and brakes, which permitted interchange of cars instead of unloading and reloading freight. The advent of the railroad was like providence for many young men in Indiana. They turned to it for employment in a field that fed thier imagination with the "romance of the rails." Although Railroad companies standardized operating rules during this time, for labor it was a time of struggle for fair practices, punctuated by strikes. The 'romance,' however, stood up in the harsh face of reality, as many continued to be employed by the railroad their entire lives. (Bass Photo Collection, Indiana Historical Society) Although the first railroads were intended as feeders to water transportation via Ohio River, Wabash, and Erie Canal, it soon became evident that the railroad could serve a much larger purpose. During the next two decades the railroad industry grew at a fast pace. By 1861 railroads were linked throughout the state, providing connections to the west via Chicago and St. Louis. Two years later 71 of Indiana's 92 counties had rail service. During this development, Indianapolis emerged as a major hub for rail traffic, and the first major city whose growth was due to and dependent on railroads. By 1850 the city was the hub of seven railroads. This success was greatly due to the Indianapolis Union Railway, which provided links to other carriers. Another reason was the opening, on September 28, 1853, of the first Union Station in the country. This innovation allowed passengers and freight to transfer in one facility, rather than transferring via wagon to other locations in the city, a typical practice in other major cities. By 1870 Indianapolis' Union Station was handling over one hundred trains a day. In 1888 a new Union Station, of Romanesque design, replaced the original building. In the period after the Civil War many Indiana lines were bought by larger entities. In the 1890's big systems like the Lake Shore & Michigan and the Cleveland, Cincinnati, Chicago & St. Louis emerged. Throughout this time of takeovers and alliances, the Chicago, Indianapolis & Louisville Railway, known commonly as the Monon, remained entirely a Hoosier entity. It was chartered in 1847 as the New Albany & Salem Railroad and in 1859 became the Louisville, New Albany & Chicago. It was the first to connect the Ohio River and Lake Michigan, carrying northbound coal and other commodities until its acquisition and closing in 1971. The Wabash Cannonball Trail ran on the two lines originally established by the Wabash Railroad. The southwestern leg was built in 1855, making it one of the oldest rail lines in northwest Ohio. The Cannonballs were known as the super trains of their time. They were equipped with smokers, parlor coaches, and Pullman Palace Sleeping Cars. During the Depression rail travel fell off as the cost was prohibitive to most travelers. The mid-1940s found the Wabash line struggling to rebuild passenger service. The Wabash Cannonball was too famous to let die. Through cash investment many of the famous runs were re-instituted or upgraded during the post-war period. On February 28, 1950, the name was reinstated and the new Cannonball's route took it from Detroit to St. Louis. In a chapter of his book on local history about Eugene Township, Indiana (1963), Harold L. O'Donnell writes about the Chicago and Eastern Illinois (C&EI) Railroad coming to town, and he discusses the danger it was to livestock. Quite often meet with woe. 1Ared Maurice Murphy, "The Big Four Railroad in Indiana,"